The Northern Ireland parliament building in Belfast. Sometimes known as the Belfast Agreement, the Good Friday Agreement was a crucial political development during the Northern Ireland peace process in the 1990s. 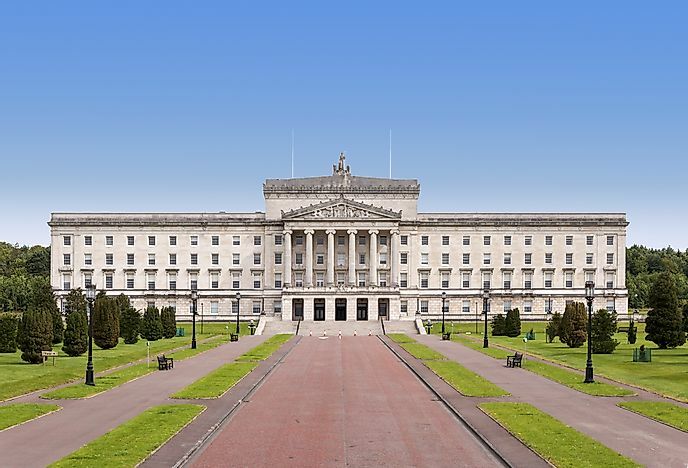 The agreement, abbreviated as GFA, is so crucial that the current devolution system in Northern Ireland today is based on what was agreed in the GFA. In addition, several institutions were made between the Republic of Ireland and Northern Ireland, and also between the UK and the Republic of Ireland. The Belfast Agreement, as the name suggests, was agreed on in the capital city of Northern Ireland, Belfast, on April 10, 1998, a day which happened to be a Good Friday. Two documents make up the agreement.One of the documents is called the Multi-Party Agreement (an agreement reached by the majority of the political parties of Northern Ireland) while the other stipulates the agreement terms between the Irish and British government (British-Irish Agreement). Three “strands” clearly stipulate the guidelines for the formation of institutions. Strand 1 was all about the establishment of Northern Ireland’s institutions. Under this strand, the Northern Ireland Assembly and the Northern Ireland Executive were established. The issues concerning institutions relating to Northern Ireland and the Republic of Ireland, otherwise known as “north-south” issues, are discussed in strand 2. The North/South Ministerial Council, the North/South Consultative Forum, and the North/South Inter-Parliamentary Association are all established under this strand. The last strand, strand 3, is all about Great Britain (including crown dependencies) and Ireland. Three institutions were established under this strand; the British–Irish Council, the British–Irish Intergovernmental Conference, and a bigger British–Irish Inter-parliamentary Body. “The troubles” refer to a conflict in the Northern Ireland during the 1990s. Sometimes, the conflict is referred to as the Northern Ireland Conflict. Basically, the conflict was between factions who had differing views over the constitutional standing of Northern Ireland. Unionists (loyalists), who were mostly Protestants, advocated for Northern Ireland to remain as part of the United Kingdom. The other party, Irish nationalists or republicans, which was majorly Catholics, advocated for the opposite. Eventually, tension gave way to an all-out riot in August 1969 which led to the deployment of British Troops.However, the force had a negative effect on the riots. Instead of quelling the uprising, warfare erupted that lasted for around three decades. Republican paramilitary groups included the likes of Provisional Irish Republican Army and others while loyalist military groups included the likes of Ulster Defense Association. Also, as part of The Troubles, there were numerous riots, civil disobedience, and other forms of rowdy behavior. An estimated 3,500 people died, with a little over half of those being civilians. The Troubles abated considerably after the signing of the GFA. The GFA committed the parties involved to a peaceful resolution of The Troubles. First, the weapons help by the paramilitary groups were to be decommissioned and then security arrangements were to be normalized in Northern Ireland. To make sure that these two crucial things were implemented, institutions were established in Britain and Northern Ireland. Also, both parties agreed to release prisoners early. Up until 2009, decommissioning was not complete although massive strides had been taken.